Going back to school is an exciting time for children. Most children worry about whether they will like their new teacher or not. Others will worry if they will have the supplies they need or appropriate clothes for school because their family cannot afford the expense. Mid Michigan Community Action was pleased to offer back to school help for families that were struggling with expenses to provide needed supplies for their children heading back to school. Six hundred backpacks have been filled with school supplies and have found a child to go back to school with. Those eligible for the program received a backpack for their school age child and a clothing voucher for new clothes. 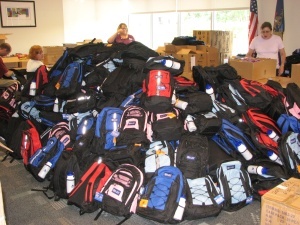 The backpacks were distributed to eligible children in Bay, Clare, Gladwin, Midland, Mecosta and Osceola counties. Staff and volunteers from Mid Michigan Community Action collected the backpacks and supplies at the outreach offices and helped fill them so they would be ready for the first day back to school.